In the era of devices and service Windows Azure Service Bus will play more and more an important role. One of typical scenarios, which are usually very difficult to solve is large scale. Service Bus is designed for unlimited scale. However the huge number of devices which can connect to the bus in a practical and hypothetical scenario is and will be always an issue. but in a typical scenario you cannot just simply connect millions of devices to it and expect that it just works. Fortunately for some specific scenarios there are solutions which just work out of the box. The good example is Service Bus Notification Hubs. Unfortunately in majority of scenarios, you have to design the system to be able to observer huge number of connections. In this context we usually talk simply about devices, because they will represent the majority of connections in the near future. But, keep in mind, connection can be caused by any kind of computer, application or similar. entities and big/huge number of connections (connected devices). Service Bus protocols and connection behavior? The SBMP is the TCP based protocol which is delivered inside of .NET client library. This protocol is by default enabled when you use Service Bus .NET SDK. The code-snipped below shows how to create the queue client from connection string and then it sends 10 messages to the queue. Finally the code below will start receiving of messages by using message pump. For more information about message pump and other V2 features, take a look on this article. (Note: This sample requires SB 2.0). AMQP is a standardized and highly performing protocol supported by many platforms like JAVA. That means by using of SB Client and AMQP you could communicate with other Service Bus systems like IBM MQ. Right now since SB v2 SBMP is highly optimized and seem to be in this context near to AMQP. Bu both of them behave similarly. They both establish the permanent TCP connection to Service Bus. In contrast to SBMP and AMQP, HTTP/REST protocol does not establish the permanent connection to Service Bus. HTTP/REST is obviously request/response based and this is a none permanent (decaupled) connection. When the instance of QueueClient is created, the new instance of MessagingFactory class is created. MessagingFactory seems often to be a hidden and unimportant artifact. But it is highly important, because it creates the permanent physical connection to Service Bus endpoint. In general, if you want to send lot of messages to Service Bus you should create multiple physical connections to increase the performance. The way to do this is called “MessagingFactory”. For example, following code creates and uses a single connection to Service Bus to send and receive the message. This is because a single MessagingFactory is in play. // Creates implicitly the connection. // Shows how to create the message. // Shows how to receive the message. You can create as many clients and threads as you want from one MessagingFactory, but all of them will use the same physical connection to Service Bus. your throughput will be limited by this connection. If you want to increase throughput, you should create multiple Message Factories and then create clients based on multiple factories. Following example will open two TCP connections to SB. // Sends the message via first connection. // Her we create a second physical connection. // Sends the message via second connection. Sometimes, you will even not deal directly with MessagingFactory. For example, you can create client instance from connection string. Now you might ask yourself how many connections (factories) will open following peace code. This is an undocumented detail. Right now (SB-V2) it will open a single MessagingFactory which will be shared by two clients. Because it is undocumented and it might change in the future. If you explicitly need control of MessagingFactory, then create it explicitly as shown in examples above. What is a connection link? In this context there is also one important and undocumented artifact, which was never officially introduced, because you will never deal with it directly. receiver or queue/topic/subscription client, one “connection link” is created, but this will use one physical connection described above. In fact you can imagine the connection link as a virtual connection tunneled through one physical connection. Following picture illustrate this. N senders created on top of a single Messaging Factory will establish N “connection links” through a single TCP connection. Last but not least, TCP connections are sometimes dropped. If that happen Messaging Factory will automatically reconnect the physical connection. But, don’t wary, all “connection links” of clients based on that connection will automatically be reconnected too. You don’t have to care about this. The term “connection link” is a virtual artifact, but it is very important when dealing with Service Bus entity quotas, which are described in next topic. 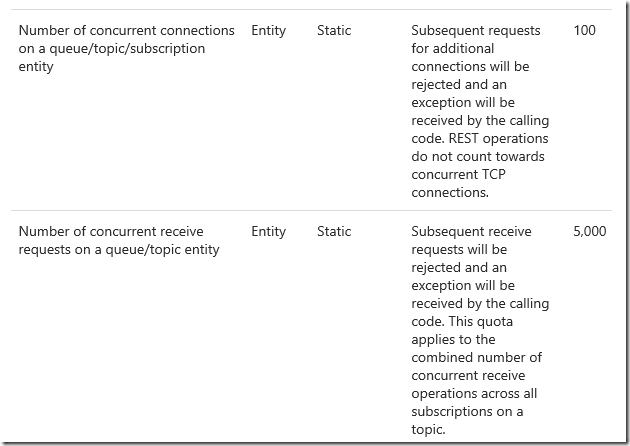 If you want to learn more about Service Bus limits (quotas), then take a look on this official MSDN article. Following picture is taken from this article. It is in this context an important part. this table will not help much. 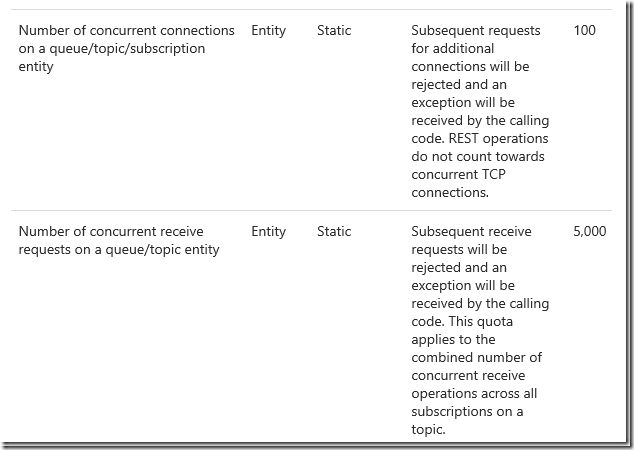 The number of “subsequent request for additional connections” is in fact the number of “connection links” which can be established to a single Messaging Entity (Queues and Topics). MessageSender-s/QueueClients/TopicClients which will send messages. This is the Service Bus quota independent on number of Messaging Factories used behind clients. If you are asking yourself now, why is the Messaging Factory important at all, if the quota is limited by number of “connection links” (clients). You are right. There is no correlation between Messaging Factory and quota of 100 connections. Remember, quota is limited by number of “connection links”. Messaging Factory helps you to increase throughput, but not the number of concurrent connections. The picture above shows maximal number of 100 clients (senders, receivers, queue clients, topic clients) which are created on top of 2 Messaging Factories. Two clients uses one Messaging Factory and 98 clients use another Messaging Factory. Altogether, there are two TCP connections and 100 “connection links” shared across two connections. How to observe huge number of devices? Probably most important question in this context is how to observe a huge number of devices (clients) if the Messaging entity limit is that low (remember 100). To be able to support for example 100.000 devices you will have to create 1000 connections assuming that one device creates one “connection link” through one physical connection. That means, if you want to send messages from 100.000 devices you need 1000 queues or topics which will receive messages and aggregate them. The quota table shown above defines also the limit of “concurrent receive requests”, which is right now limited by 5000. This means you can create maximum of 100 receivers (or QueueClients, SubscriptionClients) and send 5000 receive requests shared across these 100 receivers. For example you could create 100 receivers and concurrently call Receive() in 50 threads. Or, you could create one receiver and concurrently call Receive() 5000 times. But again, if devices have to receive messages from queue, then only 100 devices can be concurrently connected to the queue. If each device has its own subscription then you will probably not have a quota issue on topic-subscription, because one subscription will usually observe one device. But if all devices are concurrently receiving messages, then there is a limit of 5000 on topic level (across all subscriptions). Here can also be important another quota which limits the number of subscriptions per topic on 2000.
then you can use HTTP/REST. In this case the number of concurrent “connection links” statistically decreases, because HTTP does not relay on a permanent connection. How about Windows RT and Windows Phone? Please also note, that Windows 8 messaging is implemented in WindowsAzure.Messaging assembly, which uses HTTP/REST as a protocol. This is because RT-devices are mobile devices, which are statistically limited to HTTP:80. In this case Windows 8 will not establish permanent connection to SB as described above. But it will activate HTTP polling, if you use Message Pump – pattern (OnMessage is used instead of on demand invoke of ReceiveAsync). That means the permanent connections to Service Bus will not be created, but the network pressure will remain du the polling process, which is right not set on 2 minutes. request will time out and new request will be sent. By using of this pattern Windows RT device is permanently running on the receive mode. you can rather use dedicated ReceiveAsync() instead of OnMessage. ReceiveAsync() operation connects on demand and after receiving of response simply closes the connection. In this case you can dramatically reduce the number of connections.